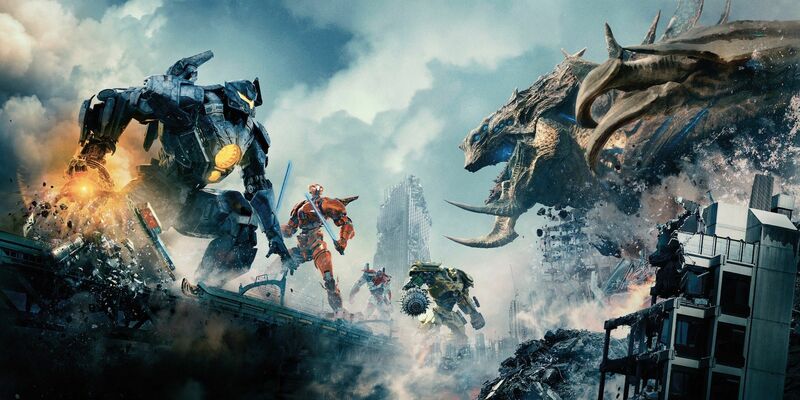 A new team of Jaeger pilots successfully went about “canceling the apocalypse” yet again in Pacific Rim Uprising, but along the way, the film’s heroes discover what the Kaiju were always after since this war started and why they emerged from the Pacific Ocean of all places. The secret’s all about rare-earth metals and how interdimensional aliens go about terraforming. Guillermo del Toro’s originally planned ending for Pacific Rim 2 would have included a huge battle that leveled San Francisco, but the version of Pacific Rim Uprising we got from director Steven S. DeKnight placed the final battle converge on one of Japan’s coastal cities nearest Mt. Fuji. The Kaiju weren’t just sent to scout out the planet in waves and to stomp cities; they were always aiming for Mt. Fuji from the very beginning, according to new information in Uprising. Don’t think about it too hard. A team of Jaegers faces off against he biggest Kaiju ever in the climax of 'Pacific Rim: Uprising'. As it turns out, the “Kaiju Blue” toxic agent that makes Kaiju blood so dangerous also reacts in crazy ways when combined with the rare-earth elements you can find in the active volcano. Dr. Hermann Gottlieb (Burn Gorman) uses this discovery to make a crazy fuel that can launch Jaegers up into the atmosphere, but he also inadvertently figures out what the Precursors were after all along towards the very end of the sequel. Forget huge monsters stomping out cities, because enough Kaiju blood mixed with enough rare-earth elements would lead to an apocalyptic volcanic event. The Kaiju were bioengineered to be huge, powerful beasts, but the chemicals in their blood are even more important when it comes to wiping out the human race. The real aim of the Precursors and therefore the Kaiju is to throw a big enough Kaiju right into an active volcano, because the ensuing chemical reaction between the blood and volcanic minerals would blow up into a cloud of otherworldly ash, killing everyone on Earth and terraforming the planet to make it just right for the Precursors. One of the Precursors from 'Pacific Rim'. We learn all this in a blink-and-you’ll-miss-it scene towards the end of the movie when Jake Pentecost and Gottlieb realize that every Kaiju that’s ever emerged supposedly headed straight towards Japan after it first made landfall. Their projected movements all moved directly towards Mt. Fuji, so the final battle against the biggest Kaiju ever starts at a coastal city near the volcano and ends right at the base of Mt. Fuji. So does that mean the Precursors will keep trying to send Kaiju into volcanos on Earth? Or will they come up with some other way to win this crazy war? If the post-credits scene is any indication, then Jake Pentecost is ready to take the fight to them, and who knows what that could look like if we ever make it to Pacific Rim 3. Pacific Rim Uprising* hits theaters on March 22. Media via Legendary Pictures (1, 2), Warner Bros.